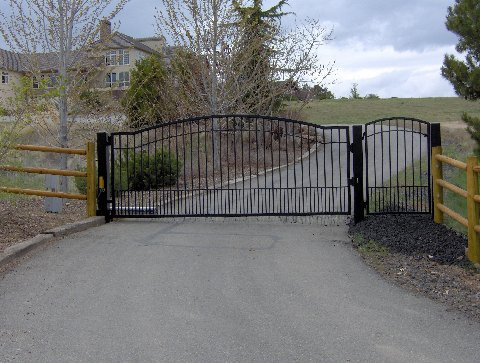 Style, safety, security, convenience – some of the many advantages of automatic gates systems. But with such a variety of systems and designs of gates available, how do you choose the best combination for your setting? We offer the highest quality operators, radios, and phone systems. We utilize only the best brands such as Elite, All-O-Matic, Doorking, and Fire Strobe. The first step is to decide whether swing or sliding gates would be the right solution for your home. If your driveway is reasonably level and you don’t need to park cars right up to the gates, swing gates may be a good choice. To create your ideal system, you can combine several access control methods – for instance, radio controls for the family, a telephone entry system or visitors, or code access for the gardener, or staff. However sophisticated your requirements, we can design a system to match them. Custom Gate Automation has been a leader in automation equipment for years. We offer total reassurance of the highest quality, great looking gate operating systems. Each of our systems is designed to meet the on-going demands of usage with the highest level of reliability and the minimum maintenance support. If you need a beautiful security gate to create curb appeal and give your home or business the comfort of safety then call Custom Gate Automation today 208-658-0311, 208-695-5001 or fill out our online request form & we will give you a FREE ESTIMATE! Emergency Vehicle Strobe Detector The FIRE STROBE 2000 provides rapid access to automatic gates and secured areas. The FIRE STROBE 2000 open gates when activated by emergency vehicle equipped with the standard operation strobe. The most common frequency is (14Hz).